Since its establishment in 1987, SHIPMANAGEMENT EXPERT SYSTEMS S.A. has given great emphasis to the quality of its operation and its products and services. The application of quality management principles and the adherence to procedures established by the company's Quality Assurance System, were among the critical factors that led SES to be accepted as an approved supplier to large shipping companies around the world. 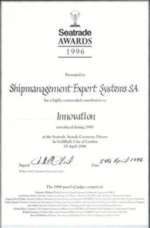 SES was highly commended and recognised by The Seatrade Awards 1996 for Innovations, and the Lloyd’s List SMM Award 2002, for the development of its Total Quality management products, designed to facilitate the challenging task of Quality Control, resulting in enhanced, safe and cost effective ship management.